Simply open your vehicle’s door and fold down the XL Seat to get started. Once you’ve transferred yourself to the XL Seat, you’ll be able to use the retractable support art to give you added safety and balance while the seat takes you up to the driver’s seat. The XL Seat will lower to the height of your vehicle’s rocker panel/vehicle floor and can be stopped at any point along the way. The transfer seat itself is covered with a vinyl surface and slight cushioning to ensure easy and comfortable transfer that can accommodate many different drivers. The XL Seat is a transfer seat that allows for minor vehicle modification and lets you keep all of your vehicle’s original features, making it an ideal option for protecting your vehicle’s resale value. Your seat will remain adjustable, fully able to recline and you’ll still get to enjoy your power or heated seats! Because this transfer seat simply transfers you to the vehicle’s original seat, you’ll enjoy the simplicity and versatility that it provides. Because the XL Seat is so versatile and compact, it can be installed in a wide range of vehicles. Minivans, pickup trucks, SUVs and even some Crossovers are all able to have the XL Seat installed into the vehicle seat’s original floor bolts with little, or no, modification to your vehicle. To get a wheelchair into a minivan via the sliding door, you can install the HI-LIFT or the SPEEDY LIFT. 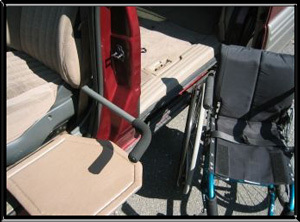 The HI-LIFT works in conjunction with the XL Seat and is bolted onto the XL Seat to lift a manual wheelchair into the minivan. With fully motorized lifting and lowering capabilities, it can lift up to 75lbs into the vehicle. To learn more about the XL Seat and whether it is the best transfer seat for you and your needs, please get in touch with our mobility experts at our London, Ontario mobility and conversion shop. At Goldline, we have over 40 years of experience in the industry and have the knowledge to provide you with the mobility solution you need.